Sadly she was abandoned by her previous owner. 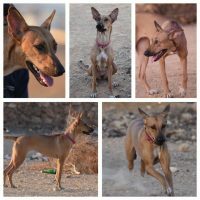 She is a sweetheart and looks for someone who loves to walk with her as she enjoys running and playing, also with other dogs. Cats are fine for her, actually for some time her only friend was a cat. She is almost two years. Izzy would be your perfect pet and friend. This Ad has been viewed 902 times.